Hanuman Jayanti the birthday of Lord Hanuman is observed individually by Hindu devotees and as a community event in temples and ashrams. Visiting temples dedicated to Hanuman and offering Pooja, prayers, abhisheka and fasting is the simplest form of worship. At home, murtis or pictures of Hanuman are thoroughly cleaned at dawn. Preparations begin early in the morning. Murtis and pictures are smeared with Sindoor. Hanuman Chalisa is recited. It is also meritorious to chant Hanuman Ashtak. The number of times it is repeated depends on the devotee. 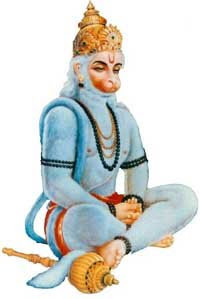 Prayers and pujas end with the recitation of Hanuman Aarti – Aarti Bajrangbali Ki. It is said that Hanuman is present where the stories of Lord Ram is recited. Therefore people read the Ramayana on the day or recite prayers dedicated to Rama. Interestingly, most Hindu fast or upvaas is observed by women. But during Hanuman Jayanti, it is mostly men that fast, especially wrestlers and bodybuilders.